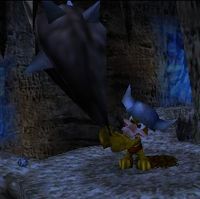 The Giant Viking Kremling is a massive Kosha and the final mini-boss of Donkey Kong 64. It is the mini-boss of Crystal Caves. He is stationary on the top floor of the cave. It attacks by smashing its club on the floor, causing earthquakes which makes boulders rain down on the Kongs. In order to defeat it, Tiny Kong must use Monkeyport to travel to the top floor while avoiding falling boulders and earthquakes. Once she reaches the top, she must position herself in front of the mini-boss. Once there, she must either play her musical instrument, use the shock wave attack, or throw an Orange while it is vulnerable. Upon being defeated, the Giant Viking Kremling does not respawn, which permanently ends the avalanches that it makes. ↑ Bocenn, Tim, and Ken Schmidt. Donkey Kong 64 BradyGames Official Strategy Guide. Page 117. This page was last edited on January 16, 2019, at 21:55.